Jules (Drayton, United Kingdom) on 27 April 2014 in Landscape & Rural and Portfolio. 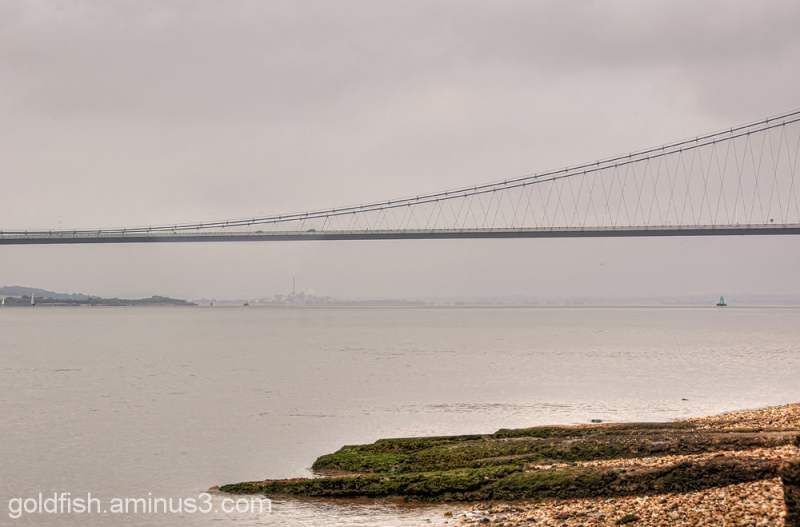 The Humber Bridge - opened by Queen Elizabeth II in 1981. It is one of the marvels of modern engineering and was, until 1998, the longest single span suspension bridge in the world but there are now five other longer bridges of this type. However it is still the longest that can be used by pedestrians. The bridge is 2,220 metres long and the towers, which are farther apart at the top than the bottom to compensate for the curvature of the earth, are 155 metres high. It was built at the narrowest point of the estuary known as the ‘Hessle Whelps’ and when completed it was admired for its design and elegance, but reviled by others as a bridge from nowhere to nowhere. with beautiful composition, colors, lighting & atmosphere! A truly amazing piece of civil Engineering. Wonderful....and thank you for all that info. The rocky sandy shore bit highlights the bridge here !! !